Sanger Institute volunteers engage with the public. This year’s Summer Science Exhibition was as exciting as ever. With over 24 exhibits it was hard not to want to look around all the fantastic displays from different universities and institutes. 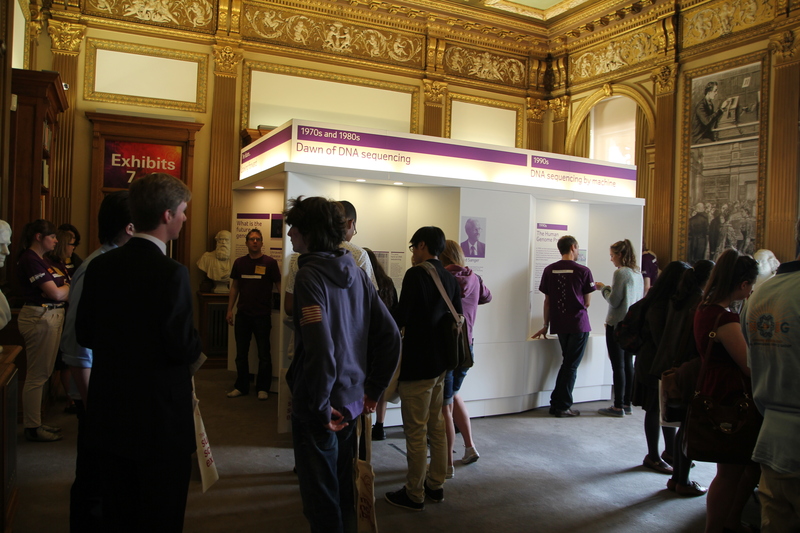 But, we had our own exhibit to tend: ‘Beyond the Genome’ where a crack team of volunteers were working hard to grab the public’s attention. The exhibit had been put up with meticulous planning and attention to detail; and it showed. It was so well thought out with plenty of interactive iPad games and a real life sequencing machine. Visitors could have a go at reading DNA sequences or venture inside the futuristic heart of the exhibit. A projection of the infamous letters G, A, T and C rotated inside the little cave adding a modern touch to the exhibit. Inside was (another) iPad where visitors could vote on things such as ‘Do you want your DNA sequenced?’ or ‘What would you not want to know about your genome?’ and above that a TV showed a loop of very serious people asking very serious questions about genomics. I liked the atmosphere of the day; it was lively and fun and everyone seemed to be having a good time. It wasn’t all serious and scientific; everyone was laid back and all the exhibitors were friendly and engaging. My favourite part was the games available to play; many of the exhibits offered a chance for the public to interact via games or demonstrations. I particularly liked the zebra fish exhibit run by the University of London which tested your impulses. The ‘Beyond the Genome’ exhibit got people to question what they wanted to know about their DNA; could you ever know too much? Information was given about the UK10K project, which aims to sequence the genomes of 10,000 people from the UK, and Fred Sanger the ‘father’ of genomics; it was an eye catching display. The exhibit was laid out in three parts; past, present and future and at each stage it was all about getting the public involved. Studies have shown that only one in seven people know what a genome is and, if genomics is the future, then more people need to learn about it. This is why the Sanger Institute partakes in exhibitions like these. Fifty volunteers from the Sanger Institute were working to engage the public with the exhibition (mainly by shouting “GO IN THERE TO LEARN ABOUT GENOMICS”). Many of the school-children said that Sanger’s exhibit was their favourite and, as a teenager, I know that the best way to get them to listen is interactivity (and free wristbands). A journalist from The Times said that our exhibit was the most visual one she had seen and she took lots of pictures of it. I very much enjoyed the day and I would recommend for anyone to go to the exhibition. There were plenty of interesting stands (but obviously the Sanger Institute’s was the best). With an innovatively designed exhibit and interactive games the Sanger Institute succeeded in teaching people about genomics.